Donuts are great any day, but I especially love getting donuts on Saturday mornings. 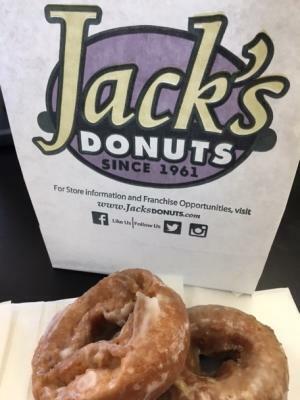 Normally, I reserve donut Saturdays for when we have visitors come to town, but last Saturday I was so eager to try the newest Hendricks County donut hot spot, Jack&apos;s Donuts, I asked my husband to venture out with me to get some. And let me tell you, it didn&apos;t take long to get him to agree to the outing. When we arrived at around 9 a.m., there was a long line at the counter, but we were served promptly. Even though there were just two of us, we decided to taste test a few different kinds. My husband ordered the Caramel Iced Roll and Applesauce Cake donuts, and I picked the Chocolate Iced Stick, a Tiger Tale and the seasonal Pumpkin Cake donuts. Every single one was amazing, but our favorites were the Tiger Tale and Applesauce Cake donut. The Tiger Tale is essentially a regular glazed yeast donut and chocolate glazed yeast donut twisted together, and the Applesauce Cake donut is extra moist with a subtle apple taste. We are going to have to go back soon, because there are so many more we would like to try. Here is a list of Jack&apos;s daily donut options: Applesauce Cake, Blueberry Cake, Chocolate Pretzel, Chocolate Twist, Chocolate Yeast, Cinnamon Twist, Cinnamon & Sugar Twist, Tiger Bun, Tiger Tail, White Bun, White Pretzel, White Twist, White Yeast, Double Chocolate Iced Roll, Caramel Iced Roll, Caramel Nut Iced Roll, Chocolate Iced Roll, Chocolate Nut Ice Roll, Coconut Iced Roll, Peanut Butter Iced Roll, White Iced Roll, Caramel Iced Stick, Caramel Nut Iced Stick, Chocolate Iced Stick, Chocolate Nut Iced Stick, Sprinkled Stick, Chocolate Iced Bavarian Creme, Powdered Bavarian Creme, Powdered Jelly, White Iced Jelly, Caramel Iced White Fluff, Chocolate Iced White Fluff and Powdered White Fluff. Prices are $1.10/donut, $6.50/half dozen, and $12/dozen. Jack&apos;s also carries donut holes, which are $1/half dozen and $1.75/dozen, and brewed coffee starting at $1.95. Jack&apos;s also has a variety of milk and juice options, and has several tables available for those who want to enjoy their donuts at the store. 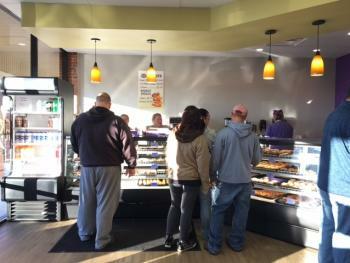 Jack&apos;s Donuts of Avon is just the latest franchise to open in the Indianapolis area. There are also locations in Muncie, Greenfield, Carmel, Fishers, Downtown Indianapolis and the original Jack&apos;s Donuts location in New Castle that opened in 1961. So next time you&apos;re in the mood for some donuts, be sure to check out Jack&apos;s Donuts in Avon. Jack&apos;s Donuts is located at 8100 E. U.S. 36, Avon. Hours are 5 a.m.-9 p.m. Mondays-Saturdays and 5 a.m.-3 p.m. Sundays.